The steps to be taken when setting up an aquarium have a logical order, and this must be respected. These steps vary slightly according to whether fresh water or sea water is being used, but the underlying principle is the same: water is not poured into the aquarium until the decor, bed, and the necessary technical equipment are in place. Cleaning the tank. Use a brand new sponge and warm water. It is best to avoid detergents. Fitting the external decor. Make sure that this is put firmly in place, otherwise it will be difficult to fix later on. Mounting the aquarium on its support. Remember that the support must be absolutely horizontal and covered with a flexible material that will compensate for any possible unevenness. At this stage, make sure that you leave sufficient space behind the tank to allow you easily to open the gallery and the entrance that gives access to the pipes and cables. The aquarium will not be moved again after this point. Fill the tank, to make sure it is watertight. Leaks are rare occurrences; a slight seepage is more common, although this can only be detected about 24 hours after putting in the water. When you are sure your aquarium is watertight, siphon out the water. If you are using an under-gravel filter, position it so that the air-lift is in one of the tank's rear corners. Installing the accessories. Place these directly into the tank or in the boxes of the box filter. The heating system must not come into direct contact with any plastic elements, and it must be near the diffuser. If you are using an external filter, do not forget the connecting pipes. Putting in the bed. 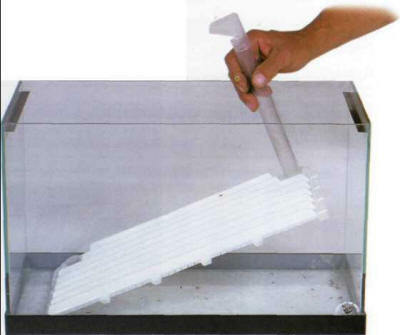 Half the sediment is placed directly on the bottom of the tank, without any prior washing. The second half is rinsed in warm water until the latter is transparent. It is then put on top of the first layer. Make sure that the elements of the decor are firmly wedged into the bed. Some of them can be used to create raised sandy terraces at this point. For aesthetic reasons, the sediment should slope downwards slightly from the back to the front of the aquarium: this gives the impression of a greater depth of field. Filling the tank. Whatever method you use - a pipe connected to a faucet or buckets - break the fall of the water to avoid dislodging part of the sediment. The time-honored trick is to pour the water into a bowl or concave plate. The aquarium must not be filled to its maximum height, as you may need to make corrections in the decor if, for example, a piece of wood starts to float. You can also put in your plants now. The water will be slightly cloudy, with microparticles on the surface that can be eliminated with a very fine-meshed landing net, or through siphoning. Switching on the equipment. First check that the heating element is totally submerged, then turn on the heating and regulate the temperature to 25°C. Plug the aeration and filtration systems into the mains. A quick glance will be enough to check that everything is working and after a few hours the water should have heated up and be clearer. Wait for another 24 hours, then recheck that the equipment is working. The water must now be clear, with a temperature around 25°C. It is sometimes necessary to make slight adjustments to the regulation of the thermostat to obtain the desired temperature. You can now add any other vegetation. Putting the under-gravel filter in place, ready to receive the sediment. The water exit must be positioned in one of the aquarium's rear corners. 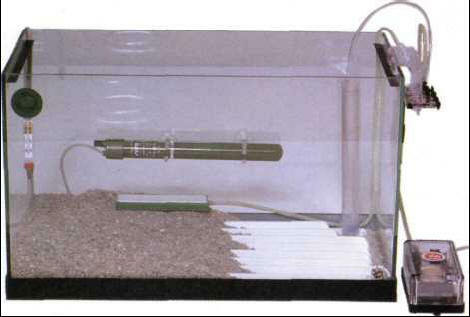 The sediment covers the undergravel filter, and the heating and aeration equipment must be camouflaged. A tank must be filled with care, to avoid knocking over any decor. Operations specific to marine aquariums. The process is identical up to stage 6. This is when you must install the aerator and the UV sterilization system. Put the decor in place and then add the bed. The latter must all be washed beforehand and then placed on a thin layer of sediment. 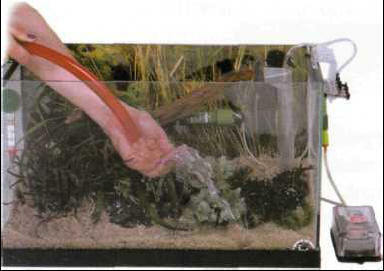 After that, fill the aquarium with the freshest water possible; only switch on the aeration. Now is the time to dissolve the salts. 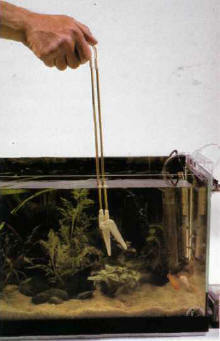 Weigh the amount you require, on the basis of the real volume of the water, before putting them into the aquarium. Leave the salts to dissolve for 48 hours, check the density, and make the necessary adjustments. Then move to stage 10, without switching on the aerator or UV system. The vegetation can be planted by hand, or with specially designed pincers. АЛЕКСАНДРОВ Максим Леонидович (р . 1939), российский ученый, член-корреспондент РАН (1991; член-корреспондент АН СССР с 1987). Основные труды в области систем диагностики поверхности и автоматизации научных исследований.